AUBURN, Ala. (AP) — Things haven’t gone the way Auburn hoped this season. After going from the top 10 to unranked, the Tigers have a chance to appease restless fans: Play the spoiler and upset their biggest rival, No. 1 Alabama. “Win this game and a lot of people kind of forget all the negative stuff that happened this year,” Auburn wide receiver Ryan Davis said Tuesday. Ditto for South Carolina against No. 2 Clemson. Not to mention Georgia Tech versus No. 5 Georgia . The Crimson Tide, Bulldogs and the Tigers in Clemson are all trying to keep their College Football Playoff hopes intact, while their in-state rivals would love to change those holiday plans. 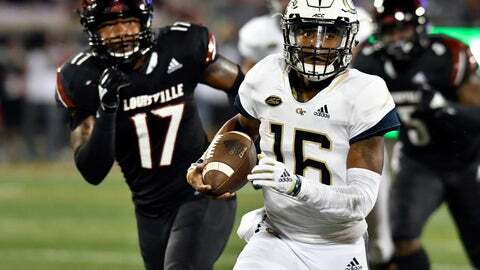 “That’s something you can keep in the back of your mind, just knowing you can spoil a lot of things they have going on,” Georgia Tech senior quarterback TaQuon Marshall said. All three playoff contenders are playing at home and are heavy favorites. Oddsmakers give Georgia Tech the best shot, installing the Yellow Jackets as 17-point underdogs. Auburn (24-1/2 points) and South Carolina (26-1/2) are even bigger longshots. The Yellow Jackets can spoil Georgia’s hopes to play in its second straight CFP. Georgia (10-1, No. 5 CFP) also needs to beat Alabama in next week’s Southeastern Conference championship game in Atlanta to move into the four-team playoff. The Yellow Jackets have won four straight, including last week’s 30-27 overtime victory over Virginia. But the streak that is the hot topic this week is Georgia Tech’s two straight wins in Athens — a 30-24 overtime win in 2014 and a 28-27 thriller in 2016. The Bulldogs were dominant in last year’s 38-7 win at Georgia Tech, but the Yellow Jackets are hoping to add to their recent success in Athens, especially when they can spoil Georgia’s national championship dream. Just a few years ago, the Gamecocks had the unquestioned upper-hand on the rivalry and in recruiting in the Palmetto State. South Carolina won five straight games over Clemson (11-0, No. 2 CFP) from 2009-13 featuring such standouts and NFL draft picks as defensive end Jadeveon Clowney, cornerback Stephon Gilmore and wide receiver Alshon Jeffery. But it has been the Tigers who’ve had the upper hand — and in a dominant way — over the past four seasons. The Tigers have won three Atlantic Coast Conference titles, played in three College Football Playoffs and won the national championship in 2016 while the Gamecocks program fell apart. South Carolina has gradually built things back under third-year coach Will Muschamp, although their first trip to Clemson in 2016 was a 56-7 drubbing that stuck with players ever since. Linebacker T.J. Brunson, the Gamecocks leading tackler, thinks Muschamp has started infusing more talent into the program. Brunson said South Carolina players understand the opportunity they have to end the losing streak, derail Clemson’s perfect season and spoil what looks like another national title run for the Tigers. The Tigers know all too well that even an Iron Bowl upset might not keep the Tide (11-0, No. 1 CFP) from a national title shot. The Tigers won 26-14 last season to earn a spot in the SEC championship game but Alabama still went on to not only make the playoffs but win another national title. This Auburn team is a bigger underdog after a season in which the Tigers fell from a No. 8 ranking to out of the Top 25. Quarterback Jarrett Stidham insists that unpredictable things can happen in rivalry games. “I think every year, regardless of what the circumstances are for either team, anything can happen in this game,” Stidham said. “Rivalry games, for whatever reason, are just like that. Ohio State-Michigan is kind of another one where anything can happen.